What Does Lake Oswego, Oregon Have in Common with the Giza Pyramids, River Kwai and Ben and Jerry’s Ice Cream Factory? 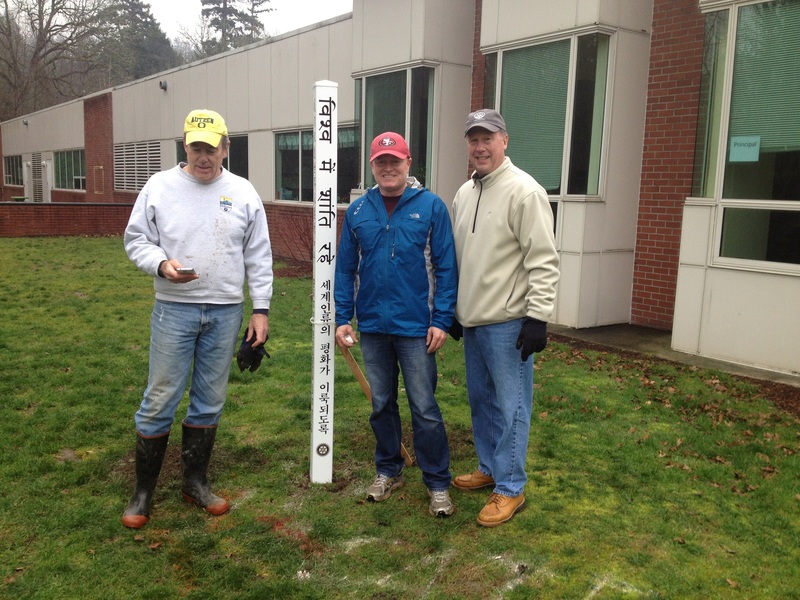 Lake Oswego Rotarians recently planted Peace Poles at the six elementary schools in town. This one, at Oak Creek, says “May Peace Prevail on Earth” in English, Spanish, Korean, Arabic, Chinese, Farsi, Russian and Hindi. Lake Oswego recently joined the ranks of locations prominent and unassuming that have planted Peace Poles bearing the message, “May Peace Prevail on Earth” in different languages from around the world. Lake Oswego Rotary members fanned out to the six elementary schools in town this past weekend to erect Peace Poles at each site. Three more will be placed at Lake Oswego City Hall, Marylhurst and the Lake Oswego Public Library (which will be unveiled as part of the Lake Oswego Reads program on February 22 to celebrate the 70th anniversary of the end of World War II). The Peace Pole project began in 1976 as a way to spread Masahisa Goi’s universal message and prayer for world peace throughout the world. Since then, it’s estimated there are more than 200,000 poles in over 195 countries on all the continents. People as renowned as the Dalai Lama, Mother Teresa and John Denver have lent a hand in planting the poles. In Lake Oswego, the Lake Oswego Rotary’s Peace Builder committee took on the project and donated these poles as part of their mission to build goodwill and peace in the world. Stay up-to-date on what’s great about Lake Oswego and what’s new by clicking the “Sign me up” button in the top right hand column. This entry was posted in Lake Oswego Clubs, Lake Oswego Schools and tagged Lake Oswego Oregon, Lake Oswego Rotary, Peace Poles. Bookmark the permalink. 4 Responses to What Does Lake Oswego, Oregon Have in Common with the Giza Pyramids, River Kwai and Ben and Jerry’s Ice Cream Factory? Fifty two weeks a year I look forward to news about LO from you. This is very good news indeed. Well done fellow Rotarian Peace Builders! Thanks Dan! Appreciate your following for almost two years now–will do my best to keep it interesting. I’ve got good material to work with. From Westport Sunrise Rotary in CT. Congrats to the Lake Oswego community and my fellow Rotarians on a great program to plant peace poles to advance world understanding, goodwill and peace. I heard about this effort from a fellow member of the Rotarian Action Group for Peace. I wish you all continue success in promoting peace. And Go Ducks. Thanks Dennis! Appreciate your reaching out.